The other primary responsibility of a preference page is to react to the performOk message. Typically, this method updates and stores the user preferences and, if necessary, updates any other plug-in objects to reflect the change in preferences. The performDefaults method is used to restore preferences to their default state when the user presses Restore Defaults. You may override performApply if you have additional processing when the user selects Apply. The default implementation is to call performOk. Preference pages should override the doGetPreferenceStore() method to return a preference store for storing their values. Preference stores are a convenience mechanism for accessing and storing preference values in a plug-in class. They provide plug-in level access to preferences that are actually stored using the runtime preferences service. AbstractUIPlugin defines a plug-in wide preference store that is maintained during the lifetime of the plug-in. Your plug-in can add entries to this preference store and update the values as the user changes the settings in your preferences page. Since preference stores use the platform preferences service, they will take care of saving preference values at the appropriate scope and location, and initializing the preference store using the appropriate mechanisms. The following code in the ReadmePreferencePage obtains the preference store for the ReadmePlugin. Note: If there are no preferences saved anywhere for a plug-in, the plug-in will get an empty preference store. 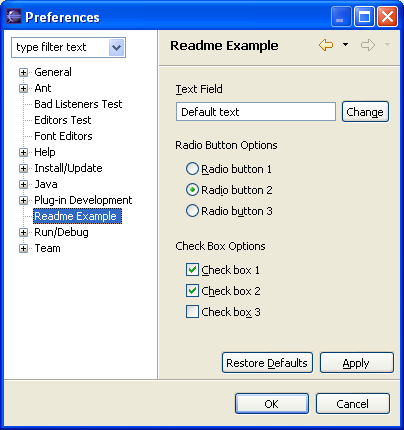 The preference store is initialized with default values in ReadmePreferenceInitializer. The preference initializer is contributed to the preferences service using the org.eclipse.core.runtime.preferences extension point. These values are used the first time the preference page is shown or when the user presses Restore Defaults in the preferences page. // is shown for the first time. Once you've associated your plug-in's preference store with your preference page, you can implement the logic for retrieving and saving the preferences. Preference pages are responsible for initializing the values of their controls using the preferences settings from the preference store. This process is similar to initializing dialog control values from dialog settings. The ReadmePreferencePage initializes all of its controls in a single method, initializeValues, which is called from its createContents method. When OK or Apply is pressed, the current values of the controls on the preference page should be stored back into the preference store. The ReadmePreferencePage implements this logic in a separate method, storeValues. When the user presses Restore Defaults, the current values of the controls on the preference page should be reset to the default values in the preference store. The default values are defined using a preference initializer, ReadmePreferenceInitializer. The ReadmePreferencePage implements this logic in a separate method, initializeDefaults.